CENTRAL SQUARE – Central Square Middle School sixth graders on Team 3 recently became expert environmental engineers in a team-based mock oil spill clean-up challenge. Sixth graders work through an oil spill clean-up activity using sponges, coffee filters and twine. 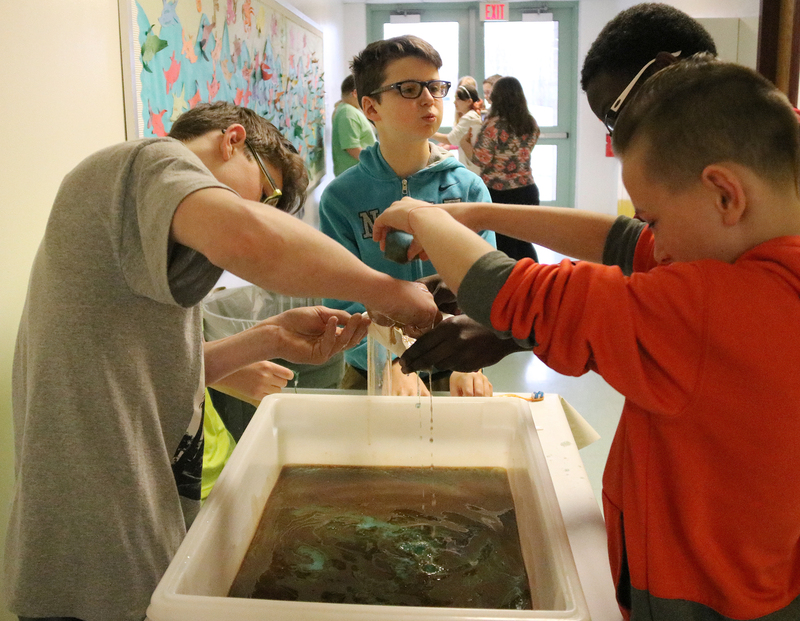 Groups of students were tasked with cleaning fryer oil dyed with cocoa powder off of feathers to give them the essence of helping animals affected by an oil spill. Students also had to separate oil from water to simulate a clean-up effort in the ocean. For both exercises, the groups had a small bag of limited supplies: a minimal amount of two kinds of soap, toothbrush, three small sponges, coffee filters, cotton balls, plastic spoons and a piece of twine. No materials could be shared between the two challenges. 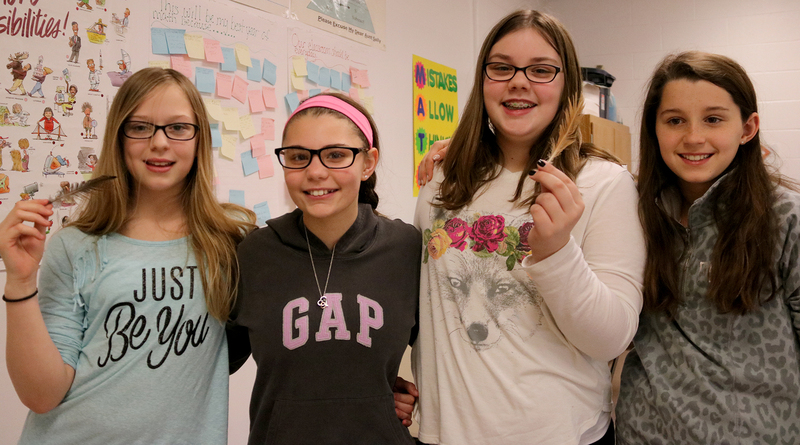 The Team 3 sixth graders used information gathered in their English language arts class from reading “World Without Fish” by Mark Kurlansky, history of oil spills in their social studies class, pollution in science class and volume in math class. After watching a brief BrainPop video on the dangers of oil spills, students brainstormed ideas before they sprang into action. Inspired by a movie she saw, one student began to use the twine to separate guide the oil toward one section of the container as a skimmer, making it easier to soak up some of the 500 milliliters of oil with a sponge. Students squeezed the sponges and coffee filters into a graduated cylinder to see which team had the most successful clean-up effort. From left: Ciara Romano, Jenika Dashnau, Emma Taylor and Alyssa Costello show off their oil-free feathers during a recent oil clean-up challenge. Most students utilized a minimal amount of soap and water, and the toothbrush to free the feathers of oil. The lesson wasn’t all fun and games. Students also had to complete a science and math reflection packet where they recorded responses about what they thought the hardest part of an oil spill clean-up is, effective clean-up methods, the percentage of oil they removed from the container and various mathematical ratios, among other highlights. Each team was graded on the likeliness of them being hired for another clean-up, as they were ranked on a scale of one to three. 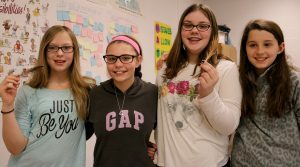 Madisyn Stuper, Emmalee Carpenter, Eva Schnauder and Dausin Gardner were the winners after having successfully removed 290 milliliters of oil.